Einstein’s famous mass-energy equivalence formula is possibly the most well-known formula of all time. It states that mass and energy are equivalent (mass and energy are never created or destroyed, they just change states), and the relationship is governed by a constant - the speed of light - squared. 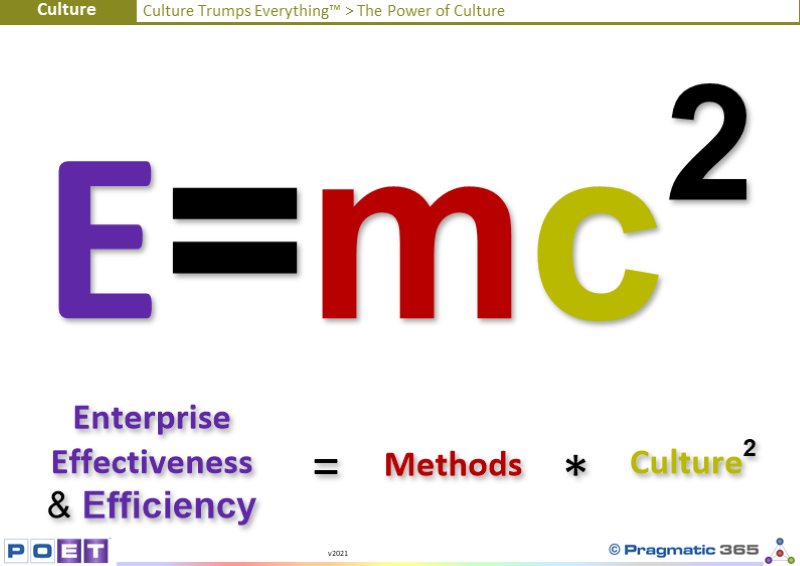 Although the full implications of E=mc2 don’t apply to Enterprises (i.e. an Enterprise’s Effectiveness and Efficiency cannot be transformed into methods, and the relationship between the two is not governed by the speed of light) it does serve as a useful way to express that an Enterprise’s Effectiveness and Efficiency, while largely governed by its Methods (how it does what it does) is governed much much more by its culture - squared. Is your Enterprise as unsinkable as the Titanic? Do the icebergs of culture that you can see, mask the hidden dangers of the 90% that you cannot see? What are you doing to make sure that the 90% of culture that you cannot see, will not sink your Enterprise?